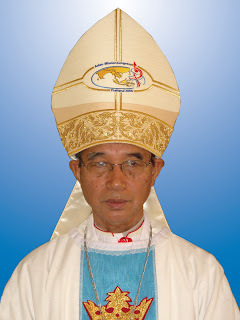 Bishop Nicholas Mang Thang was born on May 18, 1943, at Theinlawng Village in Mindat Township, Southern Chin State. He has undergone his intellectual and spiritual formations at St. Peter's High School in Mandalay from 1954 to 1957, at St. Albert's High School in Pyinoolwin from 1957 to 1963, at St. Aloysius' Minor Seminary in Pyinoolwin from 1964 to 1965, at St. Joseph's Catholic Major Seminary, Yangon from 1966 to 1973. He was ordained a priest by Archbishop Aloysius U Ba Khin on April 28, 1973. He was appointed as parish priest of Matupi from 1973 to 1978 and parish priest of Mindat from 1978 to 1980. From 1981 to 1983 he continued his higher studies at St. Joseph's Seminary, New York and obtained a Master's Degree on Dogmatic Theology. Appointed by the Catholic Bishops' Conference of Myanmar (CBCM) he served as a professor of Dogmatic Theology at Major Seminary, Yangon from 1983 to 1986 and as Spiritual Director at Major Seminary, Pyinoolwin from 1986 to 1988. CBCM again sent him to Yangon Major Seminary to take the responsibility of a Rector which he took charge from 1988 to 1989. While he was assuming that responsibility, Pope John Paul II appointed him as Auxiliary Bishop of Mandalay Diocese. He received episcopal ordination on Jan. 15, 1989. He became the first Bishop of Hakha Diocese on Nov. 21, 1992 and was installed on March 21, 1993. His coat of arms has the motto "One Lord, One Faith, and One Baptism" (Eph. 4:5). Archbishop Paul Zinghtung Grawng was born on March 20, 1939. He was ordained priest on March 27, 1965, and bishop on April 3, 1976. His installation was on July 9 1976. 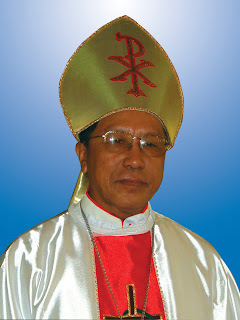 In 2003, he was transferred to Mandalay and installed Archbishop on June 16 2003. On June 29 of that year he went to Rome to receive pallium from Pope John Paul II together with Archbishop Charles Bo of Yangon. Within the Catholic Bishops' Conference of Myanmar, he is Chairman of the Episcopal Commission for Christian Family and of Myanmar Institute of Formation for Formators. An Evangelizing Community of active and mature believers, built on Gospel values, striving together towards a holistically developed society in harmony with different faiths and cultures. 5. Uplifting the quality of life, especially of the poor, in collaboration with all people of good will. Mandalay is the second largest city in Myanmar, after the formal capital, Yangon. Mandalay is remarkable for being at the heart of Burmese - Buddhist & Burmese culture. Catholic Christianity has always struggled to flourish in an enviroment that is so strongly Burmese and so strongly Buddhist. Even today the Archdiocese of Mandalay has only about 23,617 Catholics in an overall population of about 15 million people. Even so, traces of Christianity in the greater Mandalay area can be traced back as far as the 1280's. In Bagan, then a flourishing kingdom, there are frescoes containing crosses and some Latin and Greek words. It was only in the 1500's, with the opening up of trade between Europe, especially Portugal, and the various kingdoms of Myanmar, that Christians -both clerical and lay- began to arrive in any numbers. Many of the present Catholics in Mandalay trace their heritage back to this period. Successive generations of missionaries arrived, sometimes welcomed, sometimes rejected. In the 1700's it was mostly the Barnabite Priests who came to the Mandalay area. They were remarkably creative in their efforts to reach out to the local population, some of them excelling in their study of the Burmese Language and the religious language of Buddhism, Pali. In the 1800's there was brief period where the mission in the Mandalay area was entrusted to the Oblates of the Blessed Virgin Mary. By the mid-1800's there was quite a strong French political influence around Mandalay. At the same time the Paris Foreign Mision Society (M.E.P) assumed responsibility for Mandalay area. 1930's) and Missionaries of Our Lady of La Salette, in parochial as well as in formation work. The area of the Mandalay Vicariate suffered greatly during the Second World War, especially from the Japanese invasions. In 1942 the city was devastated by bombs. Together with all the people of Mandalay the Catholic Church and its institutions suffered enormously. Out of the ashes emerged new life. In 1954, Monsignor Joseph U Win was the first of the indigenous Priests to be ordained a Bishop. On January 1, 1955, the Vicariate of Mandalay became an Archdiocese, as did Yangon, marking the beginning of an indigenous hierachy in Myanmar. Various Suffragant Dioceses and Vicariates were to develop. The 1960's were to see further drastic changes in the local Mandalay Church. As foreign missionaries were sent home and "their"enterprises confiscated or nationalized, the local clergy and laity were to assume full responsibility for the local Church. The local Church was also unavoidably isolated from much contact with the wider, international Catholic Church. Only very resently has the local Mandalay Archdiocese been able to communicate more freely with the wider Catholic world. More recent Religious Congregations are beginning to arrive, lay leadership is developing among newly developed pastoral plans and the social development projects for the local people, especially the poor, are gradually able to be implemented. Any development in this diocese will always have to be in the context of an interreligious dialogue, since, even as far back as those Bagan historical roots of the 1280's,this diocese is embedded in the heartland of Burmese - Buddhist culture.